Producer Chris Peterson joined us on this trip...his first time flying! Picked up by Henry Förster (foreign student #1) and his family and went to his apartment for dinner and that first "get together!" Ordered in Chinese food (hey it tasted German to me) and sat around and talked till late in the evening! Rail Europe really came through for us! We got to experience Regional German trains. THE ICE (Inter City Express) AND the newest/fasted ICE in all of Germany, the run from Frankfurt (airport station) to Köln, 300 Kilometers per hour! (186+ miles/hour) WOW felt like going down a runway in a 747 just before the wheels lift off! Blue words are links for more info - if you'd like a large picture, email me and I'll send you a 2 megabyte size! This page will LOAD SLOW, sorry, I'll get my web guys on it and have them do thumbnail images so that you will only need to wait for a download of the pictures you want to see! 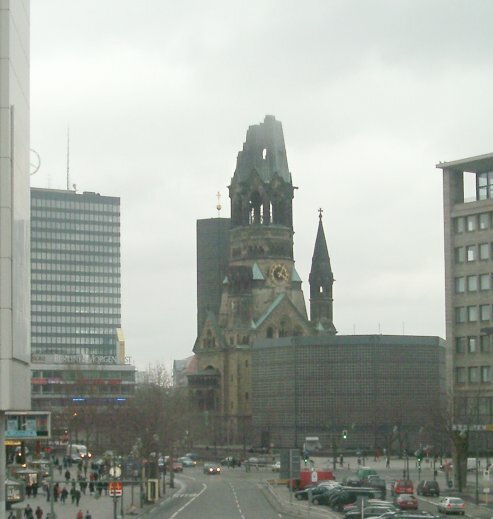 March 2, Sunday We arrive Berlin 4:15pm Berlin-Tegal Airport. A small feeling airport with 30 gates or so. Easy to get in and out. The Försters parked about 50 feet from where our luggage came out. Then on to Henry's apartment and German Chinese food! It looked the same but the tastes were definitely different! 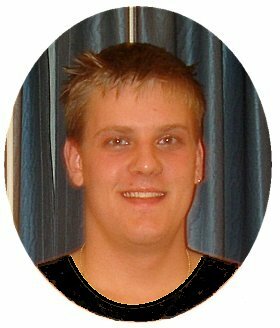 3, Mon Berlin, evening to Erfurt - a guest at the Kristian Stuebner home, Kristian was a student at Sacred Heart in East Grand Forks last year! He'll be visiting Minnesota in April! Hey, let's go for a little walk around Efrurt! 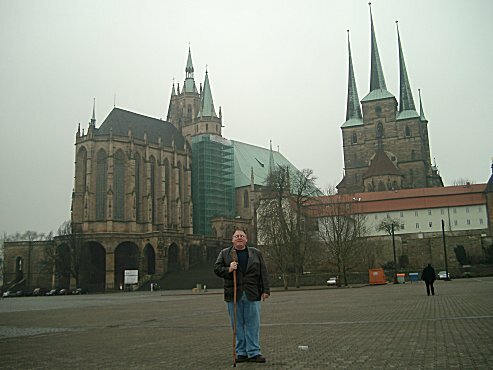 Here's the Erfurt Dom (cathedral!) 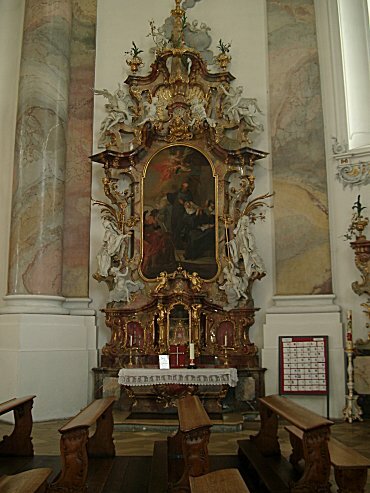 one of the largest in Europe. 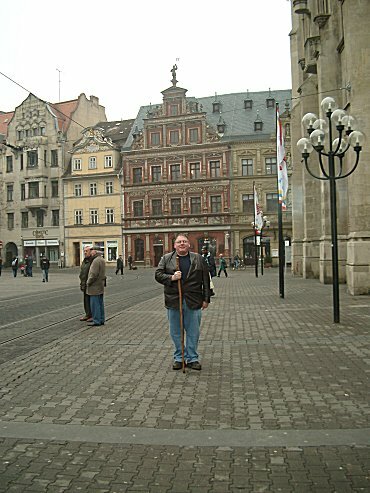 I'm standing on a public square that in just a few hours would become a huge festival in anticipation for the next day being Ash Wednesday. 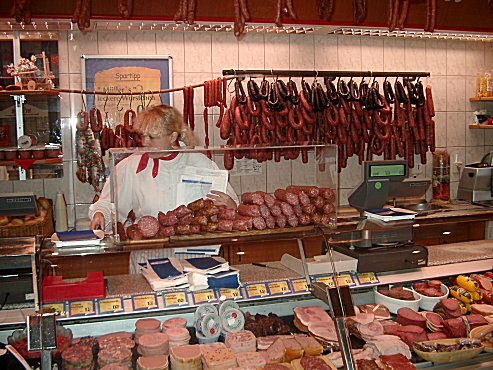 A typical Metzgeri (meat market!) notice the absence of little plastic boxes? Most things are fresh and available to cut in the size you want, wrapped in wax paper, and sent home with your. This was one of maybe 6 we walked past in less than 10 minutes. The smoked meat smell just drew me in! 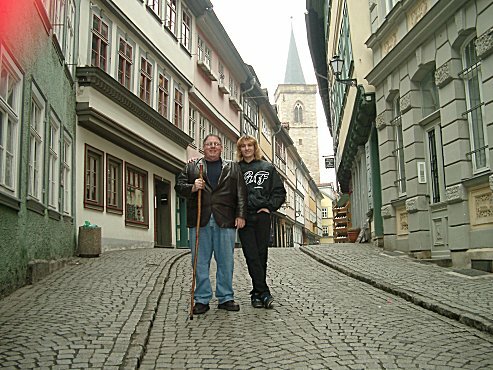 Kristian and I on a typical little side street in Efrurt! 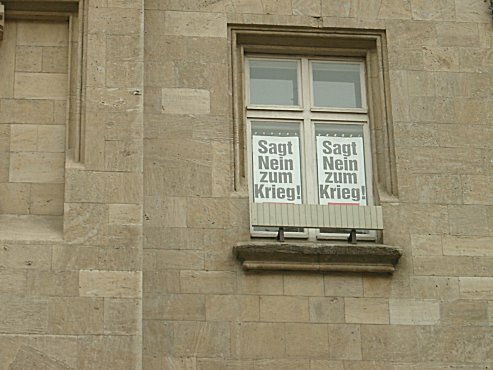 Say No to War said this poster in a window of the city government offices. Other signs say things that translate to "not this America" seeming to refer to the fact that although they are against what's happening now, there was no deep seated animosity. Everywhere the folks who were against the war really tried to impress on me that although they were against what's happening at the moment (remember this was the start of March 2003) that they wanted me to know that we were still friends (USA/GERMANY) and they really wanted me to tell them that it was OK for them to have a different opinion. 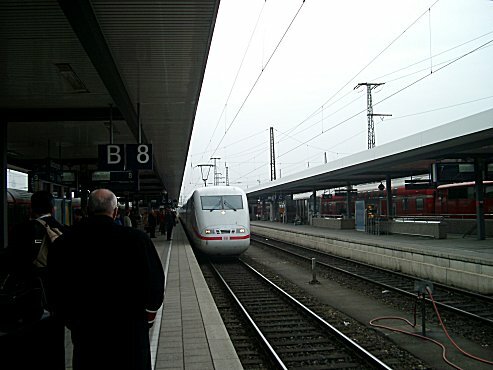 This is the ICE (Inter City Express) train, just arriving at the platform to take us south to Munchen (Munich)! If only there was more of this in the USA! 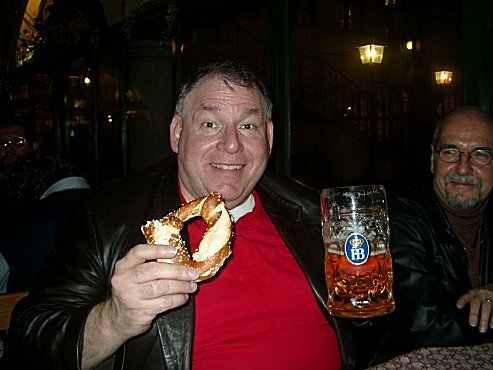 Hey what's a stop in Bavaria without a visit to the Hofbrauhaus The beer comes in Liters and the Pretzels are great! 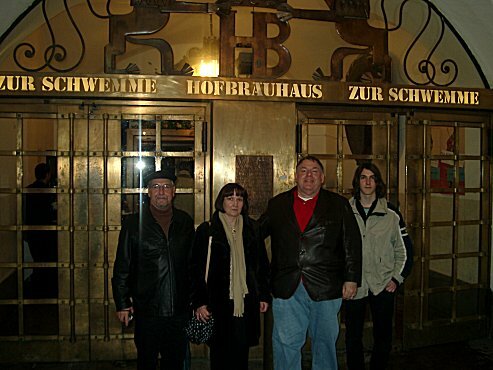 The man to my left is Franz Reitmeier, who invited us to come visit him and spend a night with his family! It was AWESOME! 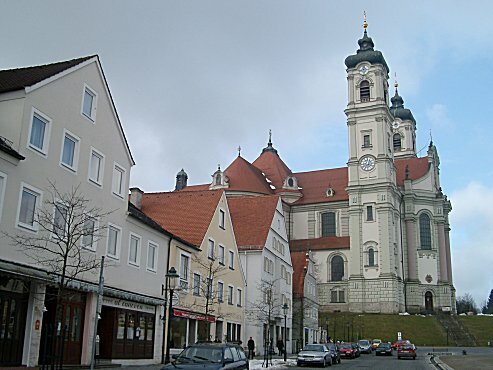 Wait till you see the pictures of the stops we made in Bavaria! Franz Reitmeier and his family! Wilma runs here own home based cosmetic and wellness company, Son Peter is finishing school and in computers. Perhaps he'll come to America for an internship with my company! Don't have dinner here though...there's great restaurants in the area. 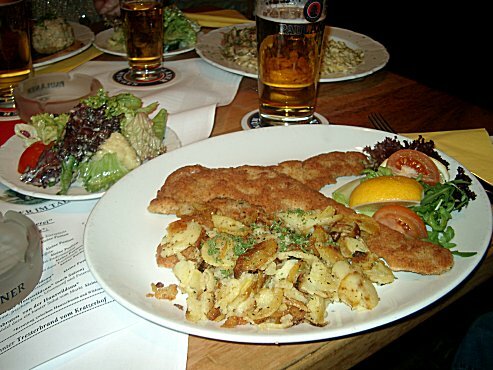 We went to the Paulaner Im Tal Restaurant! 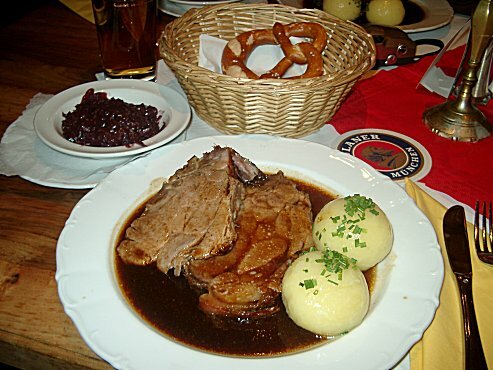 They feature pork...roast, but not just any, it's a blend of a Wild Boar, and a domesticated sow ", which gives the pork just enough "wild" taste, yet such a good pork flavor! I had the Wild Pig, with red cabbage, and Klumpsa...sort of a dumpling. Can you believe it? 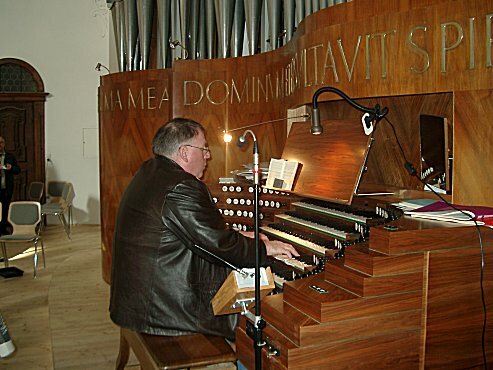 Here I am playing this AWESOME organ. It would cost perhaps 7 million dollars to create it new today. It's just gone through a 1 1/2 million dollar restoration. 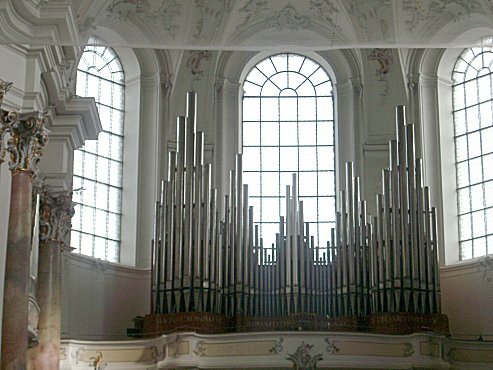 being able to sit here for an organ player is like a race car driver getting to take out the most expensive new race car for a couple of runs around the track. My heart was pounding by the time I was finished! For some Perspective...the biggest pipe on the left is about 40 feet tall! 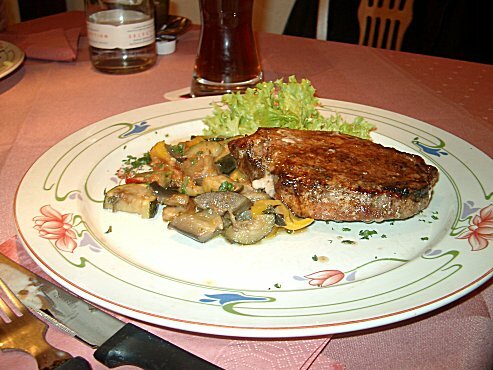 FOOD FOOD MORE FOOD...A great Restaurant in the Homberg area. 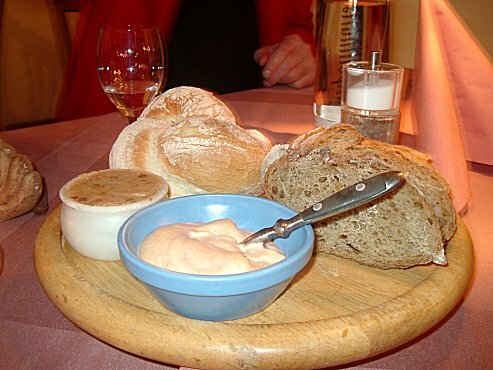 This was the bread plate...Quark (soft cream cheese) and a spiced Goose fat to spread on the great crusty bread! 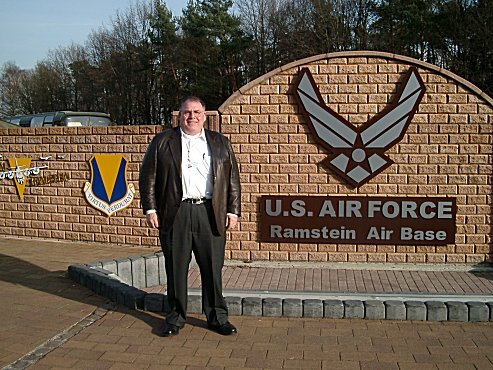 Here I am at Ramstein Air Base! Can you believe it? Thanks to Sgt. Mary Davis, and all the folks that made my visit possible, along with the great airmen/women and staff that I interviewed! 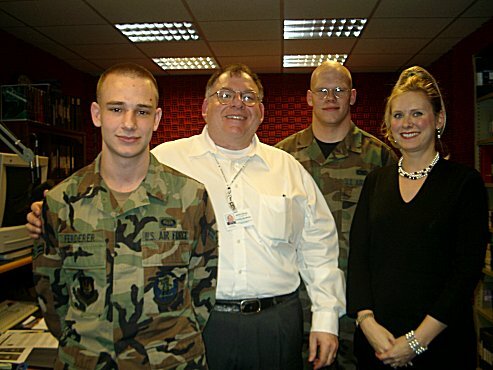 3 of my 4 interviews at Ramstein! Thank you guys! 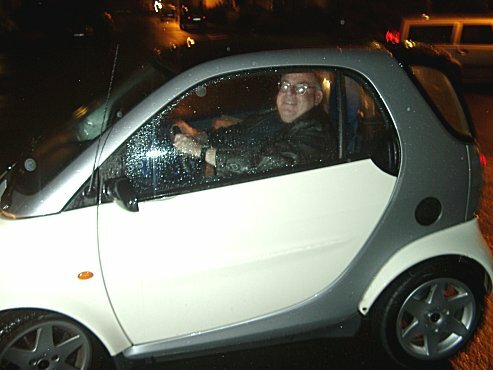 Here I am in the worlds smallest production car the SMART made by Mercedes! It's less than 7 feet long. I WANT ONE FOR FUN! from the train window pulling into one of the train stations in Berlin. This is one of the more famous war memorials. The church was bombed out by the Allies in WWII and left that way...the steeple jagged as a reminder of what war can bring. 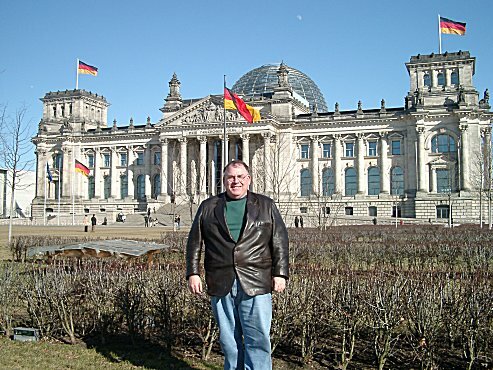 The German Parliament Building "the Reichstag" I was on the roof just to the right of the dome when I did my program. From inside the Honeycomb dome. 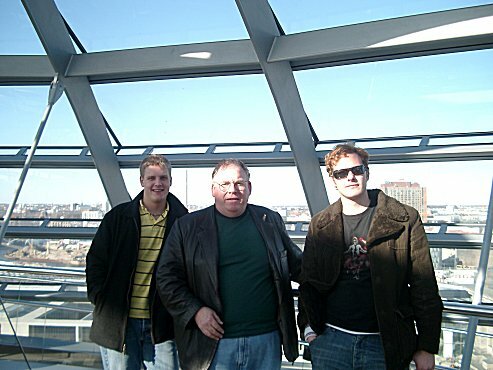 Chris Peterson on my right, Henry Förster (my first foreign exchange student) on the left. Henry is a promotion/production guy for SAT1 Television in Berlin. He creates their in-house promotions. He has been awarded to world wide broadcast awards, "the PROMAX" for a movie trailer for Indiana Jones, and the second year for Beatlejuice. My voice was on the Beatlejuice commercial. Yippie, I'm famous in Europe! Couldn't resist! Here's a picture of us eating at the Unsicht-Bar - the "blind date" restaurant that I've talked so much about! Sevem (Seven but with an M) was our server. She was AWESOME! And we thank her so much for taking good care of us. Unsicht-Bar HOW DOES AN INVISIBLE MEAL TASTE? An unusual restaurant was opened in Berlin. Visitors of Unsicht-Bar (an invisible bar as translated from German) are offered to taste meals with their eyes closed. 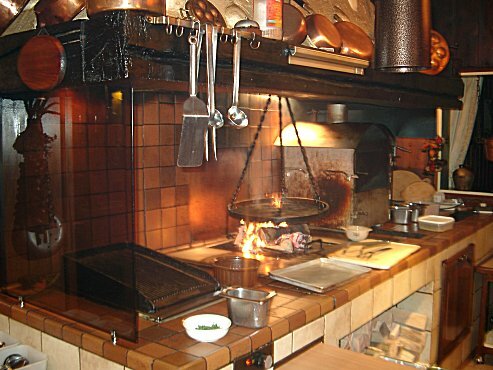 Owners of the restaurant say it is more important than that to concentrate on all senses except for the eyesight. 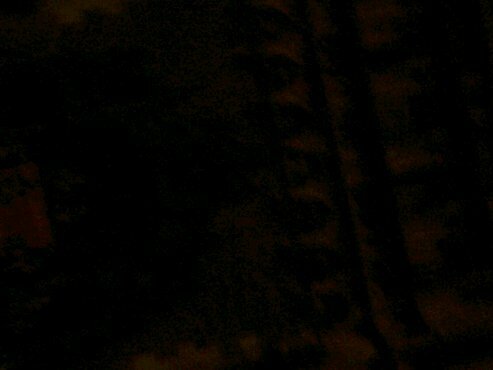 The room you are in is completely 100% dark! No exit light, no glowing watches, no cell phones! and you are served by, don't be astonished, blind waiters. The staff of the restaurant consists of 30 people, 22 of them are blind. 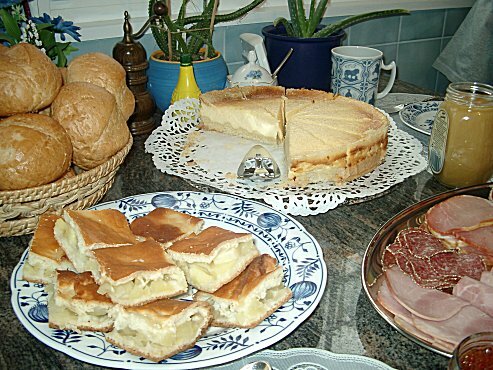 There is no exact menu at the restaurant, guests are not offered some particular dishes. 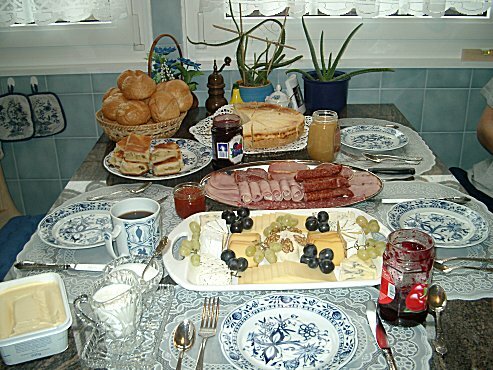 They are only asked about their gustatory passions: whether the guests would like to eat meat, fish or vegetables. Daily from 06:00 PM reservation recommended. Here's another article: Good reading! 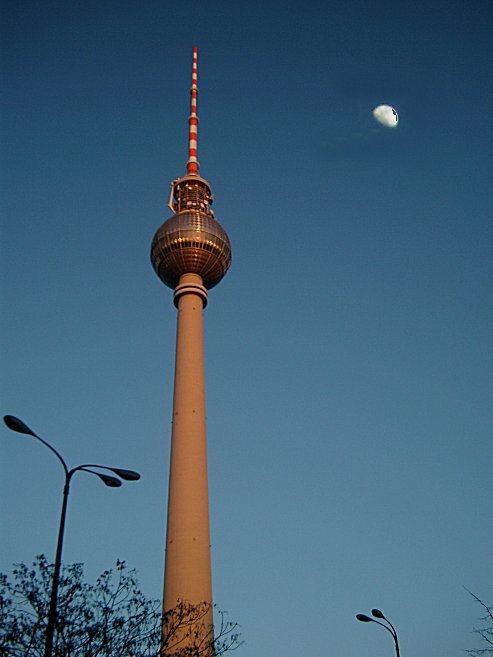 This is the former "east" Berlin television tower! It was a good afternoon for a picture...yes that is the moon on the right! Pretty cool huh? We went up to the observation deck that's in the center of the Ball! What a view! Well we missed the first flight, but thanks to a very nice KLM ticket agent, we were on the next one. It was a matter of waiting in Amsterdam or Berlin... so it all worked out! I must be getting older, those seats seem closer together every year! But the trip was uneventful and we tried to get as much rest as possible! Arrive Grand Forks (GFK) 10:05pm Wonderful to sleep in my own bed again. For the next day's we'll be LIVE from STUDIO "B" from the farm!